"This special signed edition is limited to 1000 numbered copies"--Preliminary page. Between 2008 and 2017, author John Scalzi wrote fifteen books, became a "New York Times" bestselling author, and won numerous awards, including the Hugo, the Locus and the Governor's Award for the Arts in Ohio. He also had book deals crater, lost more awards than he won, worried about his mortgage and health insurance, flubbed a few deadlines, tried to be a decent parent and husband, and got into some arguments on the Internet, because, after all, that's what the Internet is for. 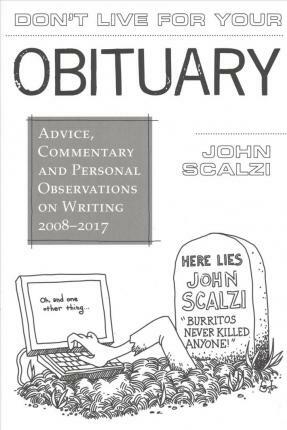 Scalzi wrote about it allthe highs and lows in the life of a working writerand gave his readers, and other writers, a glimpse of the day-to-day business of navigating a writing life in today's world. Sometimes these essays offered advice. Sometimes they commented on the practical business of publishing and selling books. Sometimes they focused on the writing issues, arguments and personalities of the day. And sometimes, Scalzi reflected on his own writing life and career, and what both meant in the larger scheme of things. "'Don't Live For Your Obituary" is a curated selection of that decade of advice, commentary and observations on the writing life, from one of the best-known science fiction authors working today. But more than that, it's a portrait of an eraten years of drama, controversy and change in writing, speculative fiction and the world in generalfrom someone who was there when it happened]] and who had opinions about it all.